The New Fire-Dex FDXL-50 Grey Leather Boots are not a new boot to just be swept under the rug...they deserve the red carpet! These awesome boots boast a traditional design, yet are lightweight and economical. Meaning, they won't hurt your wallet! With the integrated and reinforced pull on loops, it helps to make slipping them on less of a challenge. Speaking of slipping, there will be none of that, with the slip resistant Vibram Fire&Ice Sole, you're sure to be safe on the scene and in many different climates! The extra padded shin protection is awesome. When you're dealing with heavy tools and knocking things out of your way, this is an area where extra padding comes in handy! That steel toe and shank also helps keep those puppies safe and sound in there, while allowing you to be in the toughest situations. While meeting CSA and NFPA guidelines, not only do these boots look good, but they feel good, too. 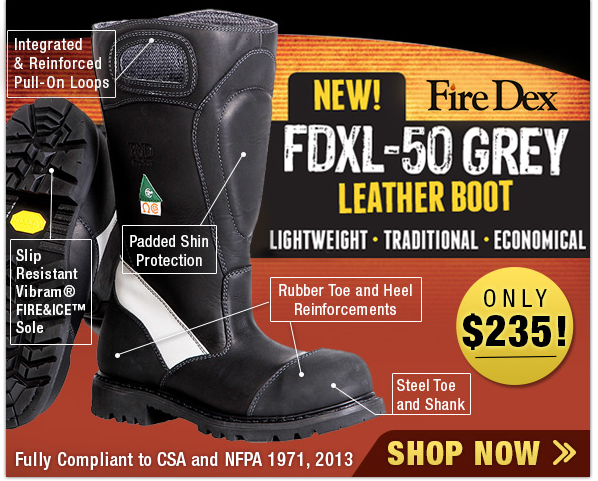 The new Fire-Dex Lightweight Fire Boots are ones you need to check out, today!